Kristin Amber Morrison meets us in the kitchen of the sunny early-Craftsman farmhouse where she and her husband run The Ecology Center. A community environmental conservation and sustainability initiative in San Juan Capistrano, the Center is situated next door to a farmstand with a seemingly endless supply of just-picked, perfectly ripe strawberries, a bowl of which Morrison presents upon introduction. She leads us outside to her studio, weaving her way through a garden complete with lazy farm cats lounging in the sun. A sun-dappled, breezy space in the base of a watertower of the same era as the main house, Morrison’s studio is a welcoming space: full of things that beg to be touched and—more importantly—used in the creation of her naturally-dyed apparel, textiles, and artwork. One side of the studio is packed chockablock with various tools, ranging from the everyday to the obscure, and jars upon jars of dyeing material. Full of petals, seeds, shells and twigs of all hues, all beautiful in their containers, but from our perspective, clamoring to be unleashed. Morrison soon indulges us, covering the bulk of her work table. 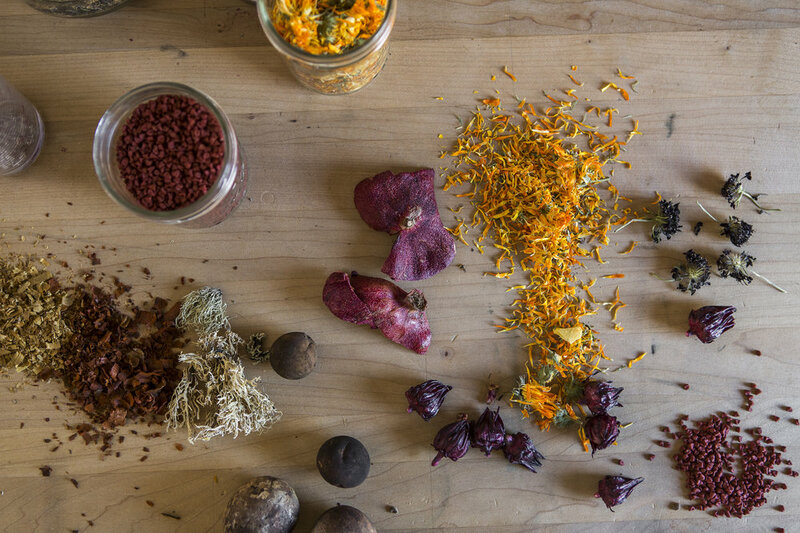 Calendula, madder root, the coveted cochineal, lichen, carob, hibiscus flower, indigo, oak balls and more mingle in a kaleidoscope of texture and color, anticipating the artful chemistry of the dyeing process. Morrison came to natural dyes by chance. Originally enamored with the aesthetic possibilities of market-produced dyes, she was teaching tie-dye workshops when a friend told her about a bounty of cochineal nearby. Tagging along out of curiosity, Morrison found herself instantly intrigued and soon obsessed. When Morrison speaks of her work, it’s the process that really inspires her. Foraging the often overlooked watersheds of Orange County, experimenting with different tinctures, dyes, and fixatives, she speaks of a certain magic to creating these colors. It’s alchemy to get the perfect combination of vibrant hue, lightfastness, and aesthetic satisfaction. Morrison gets pleasure from this juxtaposition of tangibility and mystery that nature provides to her art and revels in the chance discoveries that come along the way. The creative journey yields results that speak for themselves. Beginning with more sculptural textile arts work, it was only a matter of time before Morrison moved to apparel. Her line KAM Textiles features a range of versatile and stylish pieces that all showcase a facility with 3D construction. The drape is casual but cleanly elegant, belying Morrison’s personal attention to and affinity for each piece. She admits she isn’t one for pattern-making, preferring instead to treat the pieces sculpturally. Along with separates dyed in various colorways, KAM Textiles offers foraging aprons, undeniably reflecting their maker. Under a clear blue California sky, a sea breeze softly blowing as we tour the garden and greenhouse, it’s easy to idealize Morrison’s situation as the laid-back, carefree good life. Every part of her process takes time. 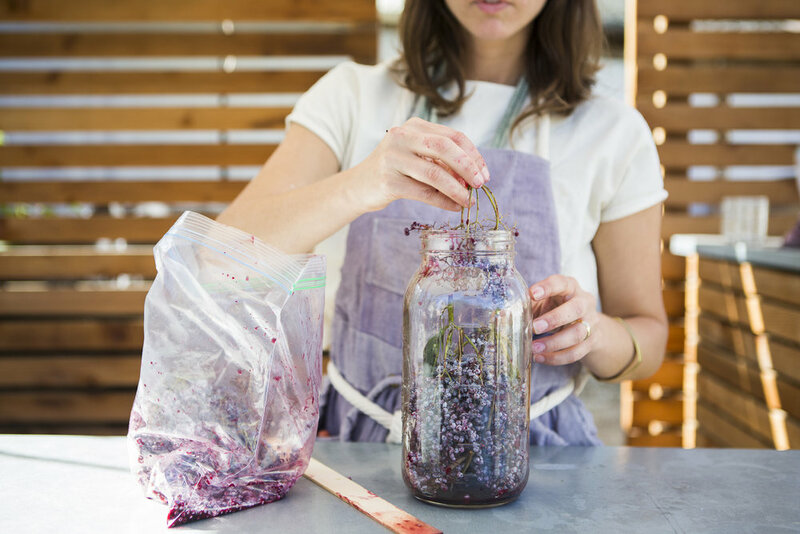 Growing, foraging, marinating tinctures, dyeing, construction—there’s no rushing any of it. But it’s short-sighted to think that it’s all lazy strawberry-eating. Morrison is interminably industrious; working on next steps for KAM Textiles, teaching workshops, running the Ecology Center and other community outreach programs. It’s hard to believe there are enough hours in the day for everything, but somehow it works beautifully for her, synthesizing into an inimitably intelligent, conscientious, and well-constructed package.